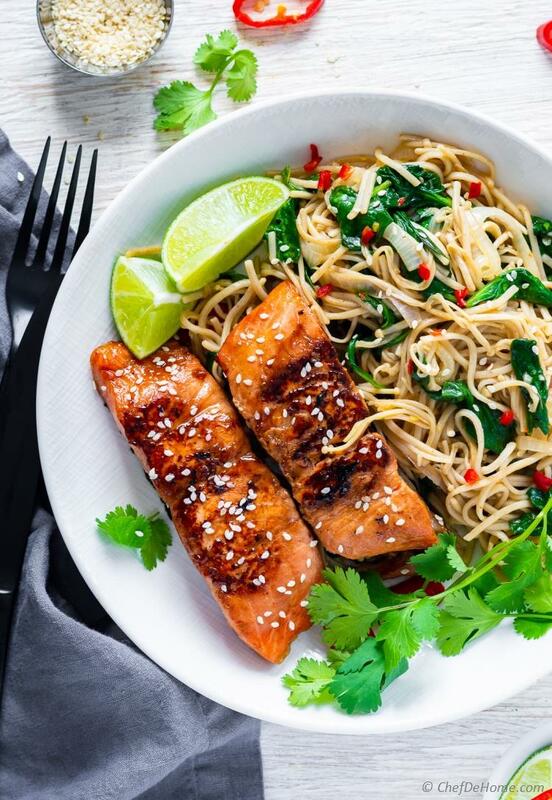 Delicious Teriyaki Salmon and Soba Noodles Bowl for better-than-takeout salmon dinner at home. 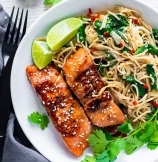 Meaty enoki mushroom, lite noodles, spinach, teriyaki salmon with splash of lime juice. It is a noodle bowl which you will make over and over again! Do you love Teriyaki in your favorite Asian Restaurant? Imagine serving same flavorful Teriyaki Bowl at home. Today, I'm sharing my ultimate Teriyaki marinade recipe which needs only 15 minutes prep. Start with my Teriyaki Salmon Soba Noodles bowl for dinner tonight. Next, try teriyaki marinade with chicken, shrimp, meat, or even tofu for a vegetarian dinner. Seriously, options are endless! 2. 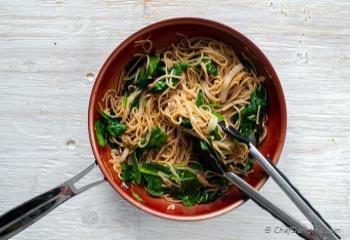 Soba Noodles stir-fry with Spinach and Enoki Mushrooms. This bowl is so refreshing and summer approved. Buckwheat soba noodles are lite, spinach and enoki mushroom are delicate and marry deliciously well with lite noodles. It is hard to say, if noodles or salmon are star of this meal. Let's say, they are made for each other. The caramelized lush color of Teriyaki glaze may sound very complex to get at home. You may even think, it will need mound of Asian ingredients. But honestly, Teriyaki marinade/sauce is a super easy sauce to prepare at home. The glaze of sauce is from sugar/sweetness, dark color is part sweetness, part soy sauce. Rest, are every day marinade ingredients which give more depth of flavor to the sauce. One ingredient often used in Teriyaki is Mirin. Don't worry we don't need it. But I do like to share what it is and how can you substitute it easily. Mirin a sweet rice wine used in Japanese cooking. It flavors food just like regular wine, plus it's sweetness gives glaze and shine to the food. When I have plans to make Teriyaki at home, I don't buy mirin specially for one recipe. Instead, I use regular white wine or Sake, Japanese rice wine, and mix in sugar for sweetness. One little secret: even port or a dessert wine can be used instead of all of the above. Once sweetness and wine is figured out. Teriyaki marinade is as good as your favorite chicken marinade - oil, soy sauce, salt, black pepper. 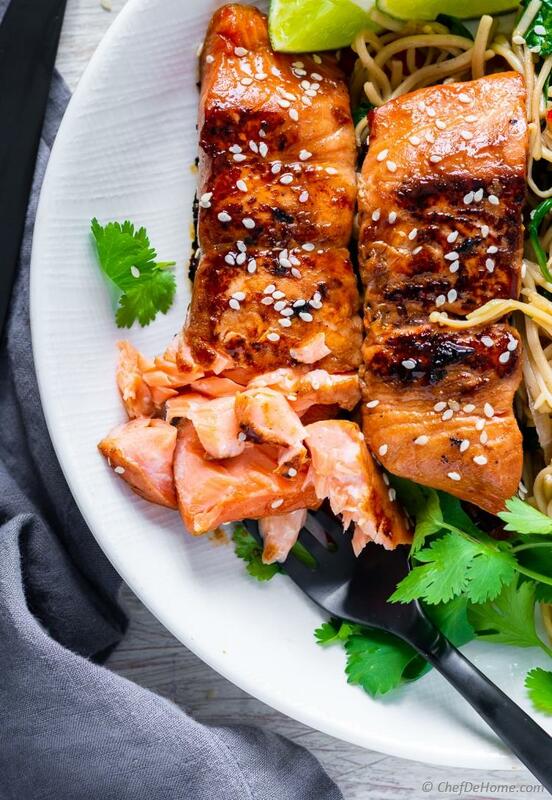 Teriyaki sauce and Salmon is one delicious combination. 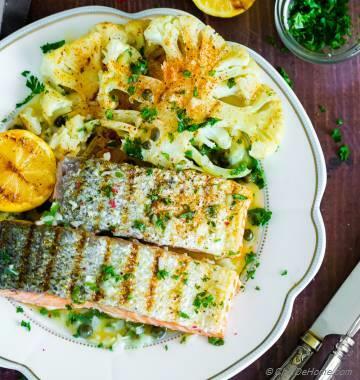 The gorgeous color of salmon and quick cooking time benefit from sweetness of the sauce. I marinate salmon for at-least 30 minutes in Teriyaki sauce marinade. 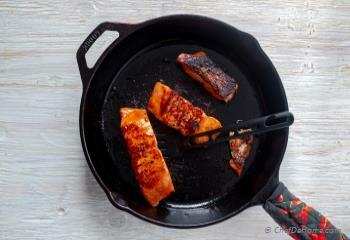 To get thick lush glaze, it is best to sear salmon in cast iron pan, or grill on charcoal grill. Salmon only needs about 3 minutes each side. By the time salmon cooks, the sauce clings on outside giving it shine and dark rich caramel color. 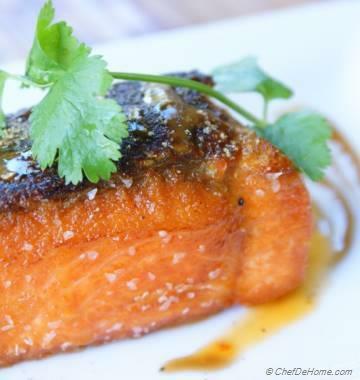 I reserve the marinade, and brush it on no-skin side of salmon for more flavor and color. Buckwheat soba noodles are lite, easy to digest and one of my favorite in Asian soup, salad and stir-fries. The refreshing lite texture is good compliment to Teriyaki Salmon. Spinach: Have I ever told you, I love wilted spinach in stir-fry or just-like-that on side of a meal?! Wilted spinach is one perfect side and you can never go wrong with it. It is nutritious, and delicious. Addition of spinach in this soba noodles recipe is inspired from my one of my earlier recipe - Spinach Soba Noodles with Coconut Lime tofu. Enoki mushroom are delicate, meaty and have very subtle msuhroom flavor. These look just like small strings of buckwheat noodle. In-fact, once I sauted mushroom with noodles, both were inseparable. If you have a piacky eatr, he will not know there are mushrooms in noodles. Guaranteed! Look at the noodles closely, if you can spot small noodle strings with match-stick-size bulb on top. For a good view, look at the step pictures. 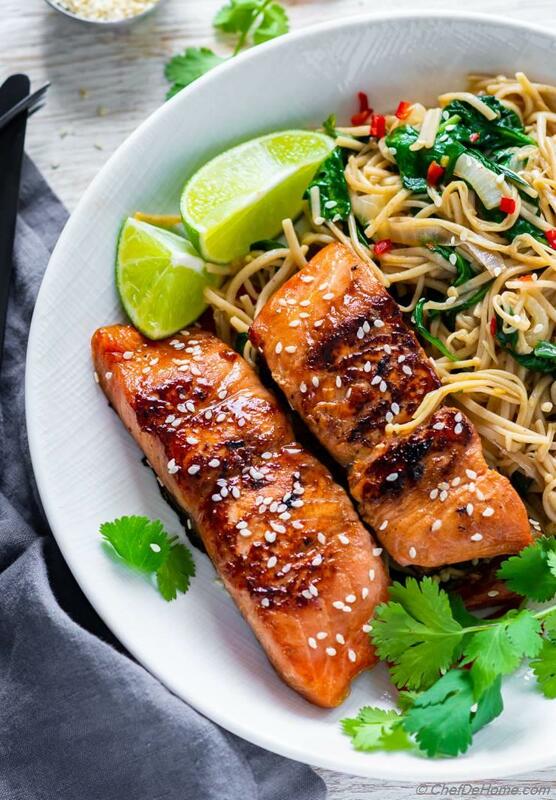 Meaty delicate enoki mushroom, soba noodles, spinach, teriyaki salmon and splash of lime juice. It is a noodle bowl which you will make over and over again. Often, everyone ask me where do I buy soba noodles. If you wondering too. Check the brands I use on my Amazon Brand page. Friends, I'm so glad to bring to you my Teriyaki Salmon Recipe. I hope you will get chance to try it with Soba Noodles, spinach and mushroom stir-fry! Oh, don't forget a good splash of lime juice to seal every bite! Yumm! Smart Swap Add more veggies such as broccoli, or asparagus for veggie-full dinner. 1. In a wide bowl, add Teriyaki sauce ingredients - soy sauce, sugar, ginger, wine. Mix well until sugar dissolves. 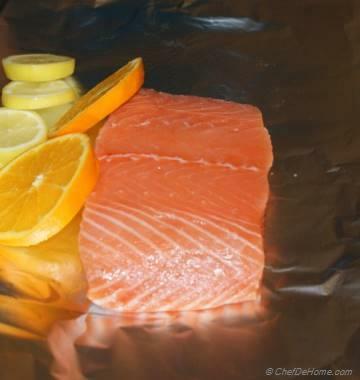 Reserve a tbsp of marinade and add salmon fillets in remaining marinade, coat in sauce. Refrigerate to marinate at least 30 minutes to up-to 2 hrs. 2. Cook Soba Noodles according to package directions. 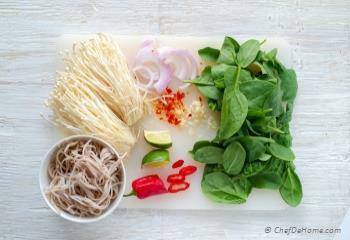 While noodles cook, prepare all the ingredients for stir fry: enoki mushroom, spinach, red onion, garlic. After noodles are cooked, drain, run under cold water and set aside. 3. Heat sesame oil in a wide skillet. Add onion and cook until soft. Add garlic, red chili and enoki mushroom with generous pinch of salt. Saute until mushroom is tender. Add in cooked(drained) soba noodles with a tablespoon of marinade reserved from step 1 and stir until alcohol evaporates, marinade disappears. Add spinach and toss with noodles until spinach has just wilted. Add a tbsp lime juice. Season with salt and black pepper to taste. Remove from heat and set aside. Enoki mushroom are very delicate and cook quickly. Keep an eye in 2-3 minutes. 4. Heat skillet with two tbsp of oil. 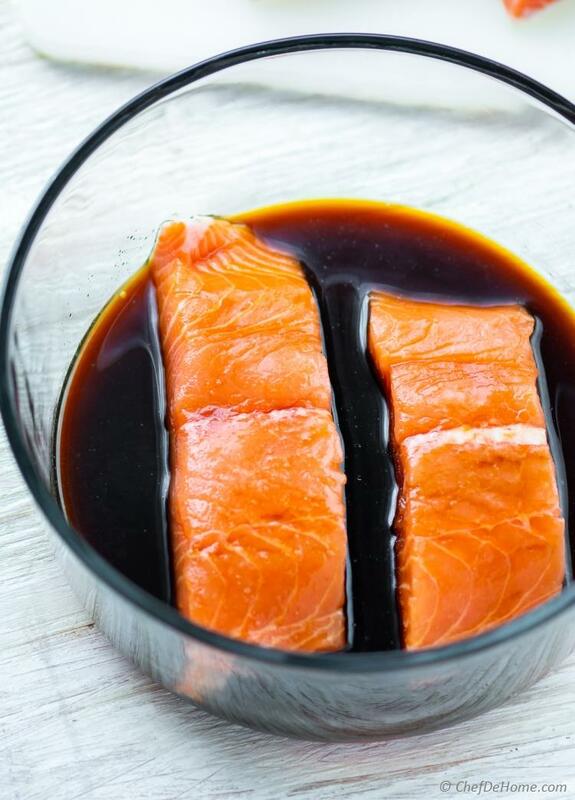 When oil is hot, remove salmon from marinade, season with salt from both sides. Place in skillet skin side down. Let cook for 2 minute on medium heat. Flip and cook other side for 2 minute. 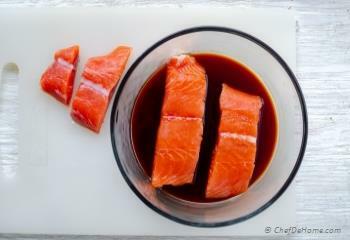 Brush reserved marinade on top, flip again and let cook until salmon is ready (1-2 minutes). 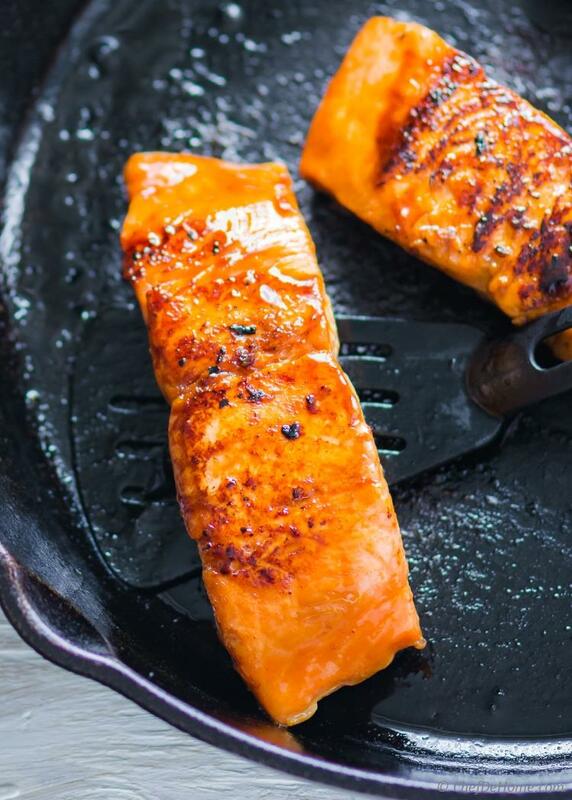 Remove salmon from pan. Note: I did not pour glaze on salmon. This step is optional. 6. 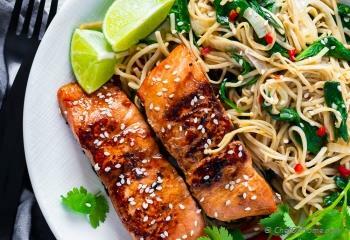 Transfer the noodles to 2-3 bowls, top with Teriyaki Salmon dividing equally. Spoon glaze over salmon (if using). Garnish with cilantro, and sesame seeds. Serve lime wedges on side. 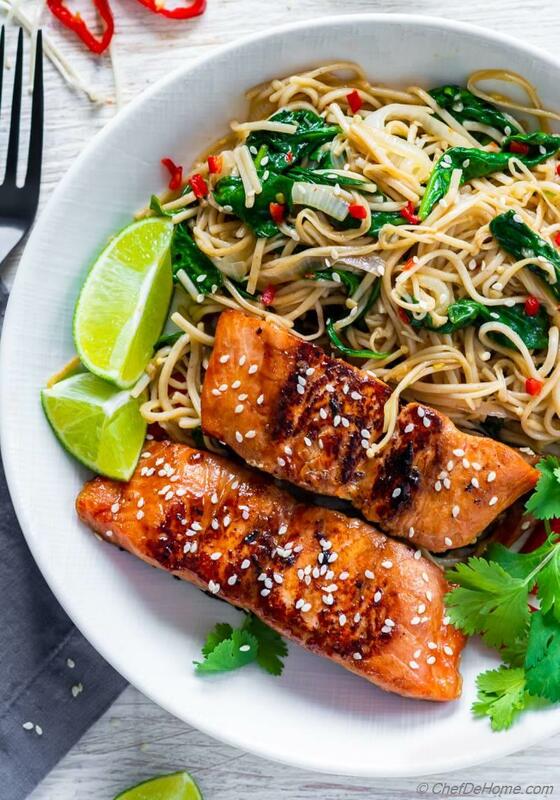 A good slash of lime juice brings out flavor of salmon as well as noodles. Serve and enjoy! *Use low-sodium soy sauce or gluten free tamari.